"MM EXPO MAGAZINE" - THE EARLY HERALD FOR THE "INDUSTRIAL SPRING"
The "MM Industrial Magazine" has again offered its patronage - the magazine is the main media sponsor of the STOM expo series. Now the professional expo guide is out for all those interested in the expo. 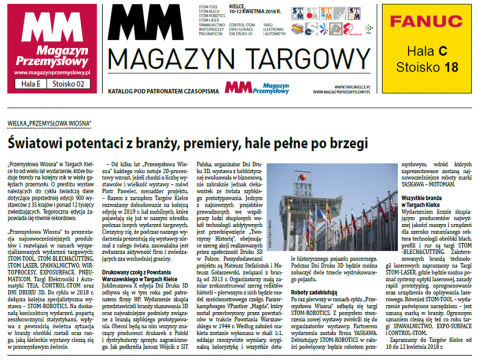 The publication of "MM EXPO MAGAZINE" makes it possible for each reader to know all the ropes and become an informed visitor of the Targi Kielce's event. The magazine contains the expo-floor plan with the list of exhibitors and the map of expo stands, descriptions of the most interesting products put on show, the list of products registered for the expo prize, industry-focussed reports, problem-focussed articles and information about technical innovations. The MM EXPO MAGAZINE and is a must-read for those who visit the STOM-TOOL, STOM BLECH & CUTTING, STOM-LASER, STOM-ROBOTICS, WELDING, EXPO-SURFACE, CONTROL-STOM, PNEUMATICON, TEiA, WIRTOPROCESY and 3D PRINTING DAYS expo cluster held in Targi Kielce from 10 to 12 April.